So here we are. My name was Eileen Dunlop. Now you know me. I was twenty-four years old then, and had a job that paid fifty-seven dollars a week as a kind of secretary at a private juvenile correctional facility for teenage boys. I think of it now as what it really was for all intents and purposes--a prison for boys. I will call it Moorehead. Delvin Moorehead was a terrible landlord I had years later, and so to use his name for such a place feels appropriate. In a week, I would run away from home and never go back. The Christmas season offers little cheer for Eileen Dunlop, an unassuming yet disturbed young woman trapped between her role as her alcoholic father's caretaker in a home whose squalor is the talk of the neighborhood and a day job as a secretary at the boys' prison, filled with its own quotidian horrors. Consumed by resentment and self-loathing, Eileen tempers her dreary days with perverse fantasies and dreams of escaping to the big city. In the meantime, she fills her nights and weekends with shoplifting, stalking a buff prison guard named Randy, and cleaning up her increasingly deranged father's messes. When the bright, beautiful, and cheery Rebecca Saint John arrives on the scene as the new counselor at Moorehead, Eileen is enchanted and proves unable to resist what appears at first to be a miraculously budding friendship. In a Hitchcockian twist, her affection for Rebecca ultimately pulls her into complicity in a crime that surpasses her wildest imaginings. Played out against the snowy landscape of coastal New England in the days leading up to Christmas, young Eileen's story is told from the gimlet-eyed perspective of the now much older narrator. Creepy, mesmerizing, and sublimely funny, in the tradition of Shirley Jackson and early Vladimir Nabokov, this powerful debut novel enthralls and shocks, and introduces one of the most original new voices in contemporary literature. "Eileen swaddles the reader in its dark and sinister mood. Moshfegh's brilliant storytelling builds an almost sadistic level of suspense, so that you can't help but lean in and listen to the narrator, however despicable and repulsive her confession becomes." 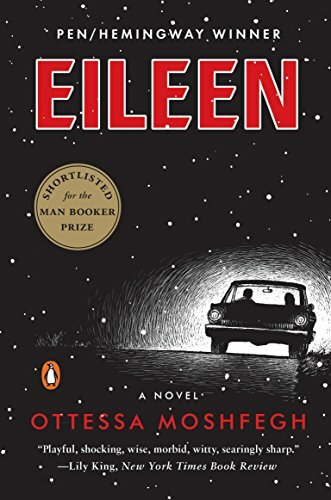 "Eileen is a singular read, dark and funny and full of oft-queasy truths, ones that may at first seem strange and disturbing, but then are not so far away from our own internal thoughts. Eileen is quiet, awkward and lonely. As Christmas approaches, she is desperate to leave her alcoholic father, her dismal home life and her mind-numbing job at a boys' correctional facility. Enter her glamorous "new friend" Rebecca and suddenly Eileen is set on a path towards inevitable change, a suspenseful ride to the end. Atmospheric, cinematic, and deliciously uncomfortably heartwarmingly pathetic in the best of ways." "Eileen is unlike anything I've read since, maybe, Patricia Highsmith: a wholly captivating look at a character you're drawn towards in a strange, inexplicable alliance and from whom you can't easily part. I find myself thinking about it still, months later, in the most unexpected ways. Mosfegh has a way with the kind of imagery that brings her world into terrible, precise emotional focus, and the book builds like a slow avalanche. What a pleasure to read!"